This installment of the Star Log-series clocks in at 10 pages, 1 page front cover, 1 page editorial, 2 pages of SRD, 1 page blank, leaving us with 5 pages of content, so let’s take a look! 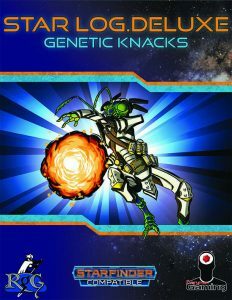 So, while the unique Blood Space of the Xa-Osoro system has many an effect, one is lesser known, and manifests as a kind of genetic mutation – the knacks introduced within this pdf! We begin the rules-section with the new Genetically Gifted theme, which nets you a genetic knack and a limiter at 1st level, as well as the ability to accept Strain Points. For each such Strain Point you accept, you reduce your current and total number of hit points by 1/4 your character level, minimum 1. Being reduced to 0 hit points does not put you at risk of dying. Damage from Strain Points can’t be avoided or redirected and the only means to heal them, is to rest for a full 8 hours. You can accept a maximum of 1 Strain Point per round, up to a daily maximum of 3 Strain Points per day. The rules also clarify that external forces may force you to accept more Strain. Issues here: The theme’s ability adjustment applies to a physical ability score, but does not note the standard +1 value of said adjustment. Additionally, this base array has two obvious “see page #” layout botches that really should have been caught. At 6th level, you add your highest physical ability score modifier to the cap of daily Strain points you can accept. You may also accept 2 Strain Points per round. At 12th level, you can spend one Resolve Point whenever you’d be required to accept 1 Strain Point instead. Here, the rules-language is also a bit wonky: The ability should read “spend one or more Resolve Points…” since it’s clear from context that using Resolve to pay for Strain needs to reduce the cost to 0. This can be used key ability modifier times per day. At 18th level, 2/day, you can accept 1 Strain point to regain 1 Resolve Point. This cost may not be mitigated, and the character can accept up to 3 Strain Points per round. Characters with this theme can choose one genetic knack at 1st level. At 2nd, 4th, 6th, 9th, 12th and 18th level, you may then take genetic knacks as replacement class features – it should be noted that you need to choose ONE. Not all are unlocked. That is not explicitly spelled out here. Genetic knacks are extraordinary class features, and their save DC, if any, is DC 10 + ½ character level + highest physical ability score modifier. Only, the talents that have saves have other ones. Strange inconsistency. Genetic knacks provide a base theme benefit, and structurally, offer 4 2nd-level talents and 4 9th-level talents each. There are 3 genetic knacks provided: Explosion, laser and Strength. Explosion makes your sweat combustible; the theme benefit nets you the benefits of token spell (not italicized) for the purpose of lighting your hands, and converts, if you choose to, half your unarmed damage to fire damage, as if it had the flaming weapon fusion (italicization missing). This also replaces the archaic with the bright weapon quality and makes unarmed strikes lethal. The talents let you accept strain to attack the lower of EAC or KAC with your unarmed strike or lob your sweat as a grenade of sorts. Odd: Save here is based on key ability modifier, not the usual save DC. There also is one that lets you make a guarded step in difficult terrain or briefly enhance your speed. Finally, one talent available to explosion, laser and strength lets you add +1/2 character level to Athletics checks made to swim, jump, etc. for 10 minutes. Also available for these three knacks would be the 9th level critical blow talent, which lets you accept 1 Strain when criting targets with the theme benefits to apply a series of benefits to the crit, with different additional costs. RAW, you can’t inflict the stunned condition, since base cost 1 +3 = 4, and the maximum number of Strain Points you can accept per round is 3. Howitzer lets you accept Strain as a standard action to make a 20.-ft.-line, which is treated as a line and unwieldy ranged attack. Strength modifier is added to atk and damage if the attack would usually be melee, i.e. for explosive and strength. Explosion and strength can choose knack propulsion as a 9th-level talent build on knack leap, and allow you to fly brief bursts, requiring that you end your movement on solid surfaces, unlike you have at least 5 knacks. This fails to specify maneuverability for the flight, short though it may be. An exclusive of the explosion knack would be the stun grenade talent, which lets you upgrade the grenade talent to a stun talent. Here would be as well a place as any to note that the talents lack prerequisite-lines, which isn’t exactly new player friendly. That should definitely be included in the talents. The second knack lets you FIRA YOUA LAAAZ000RZZZ, duplicating a laser pistol with an item level equal to character level as part of any action or ability that would otherwise work in conjunction with one. You can fire from mouth “IMA CHARGIN…”, nose, etc. and get 20 shots per day, upgrading by +20 at 9th and another +40 at 14th level. This resets after a 8-hour rest, or after a 10-minute rest to regain Stamina if you accept 1 point of Strain. The talents lets you optionally cause nonlethal damage, add the bright quality and save-less dazzle on a hit or charge the laser as a move action, upgrading it to laser rifle status. For Strain, the latter has a longer duration. The talent exclusives allow for burst addition or for automatic dazzling and blinding on a failed save if critically hit. Once more, oddly, save DC deviates from the default. Laser and strength knack users can accept Strain to gain the penetrating special quality for 1 hour. The third knack would be might, which nets you a 1d3 lethal damage unarmed strike sans archaic property. The theme benefit also nets you a special weapon specialization with these, allowing you to add 1.5 character level to damage rolls. If you have natural weapons, this instead nets a scaling damage bonus that caps at +5 at 17th level. The exclusive talents include increased carrying capacity and immunity to the encumbered condition if you have Strength of 20 or more, with Strength 25+ allowing you to carry twice the Strength score’s bulk before becoming overburdenend. You can also decrease the penalty of full attacks to -3 for 1 Strain via a level 9 talent. The system presents 8 limiters: Burnout makes the genetic knack require an activation action, and it only can be active for a time before penalizing you. Darkness or Light Attunement hinder the use of knacks depending on lighting conditions, increasing Strain costs. Exhausting, well, exhausts you. Limited adds a cooldown that can be paid off with Resolve. Increased HP reduction due to Strain, temporary feeblemind (italicization missing) and becoming sickened complement these. Editing and formatting are not as tight as I’ve come to expect from the series: Both on a formal and rules-language level, there are quite a bunch of issues that have crept into this pdf. Layout adhere sto a two-column full-color standard and the pdf sports a nice artwork. The pdf has no bookmarks, but needs none at this length. Damn. I really like what Alexander Augunas’ genetic knacks attempt to do, and the chassis is really interesting and fun. But the execution is uncharacteristically rushed for a designer of Alex’ caliber. From formal hiccups to system-internal inconsistencies, this feels rushed. Not to the point where it’s not fun anymore, mind you, but still. Not nearly as refined as usual. My final verdict can’t exceed 2.5 stars, though I will round up due to the concepts being too good to deserve otherwise. You can get this interesting, but flawed pdf here on OBS!